The eye examination not only measures your prescription (and the powers of corrective lenses for you, if needed). It’s also where sight conditions can be detected early, increasing the likelihood of successful treatment. Common sight conditions are listed to the right, or below if you’re viewing this page in a narrower window. Click the [+] next to each title to read more. Further video resources are also available on this page. We strongly recommend our Premium examination (40 minutes) which includes retinal photography, so that all aspects of your eye health can be examined in detail, screening for many conditions such as cataracts, glaucoma, high blood pressure, diabetes and macular degeneration (dry or wet). We will take images of each eye and take the time to explain them to you, showing you the different areas on the pictures such as the optic nerve, the blood vessel system and the critical, central region of retina, known as the macula. All images can be stored and then compared at your next examination, so that we can monitor any changes. It is normal for the focussing lenses inside our eyes to change with age, gradually becoming less clear. This has the effect that less light passes through, and light can also become scattered within the eye. The eye then becomes more sensitive to bright light and the vision becomes foggier. A cataract develops causing the lens to become cloudy or more opaque and, as the opacity increases, the vision deteriorates. The most common cause of a cataract is the normal ageing process described above and most people start developing cataracts in their late 60’s. It can also develop due to trauma, radiation or diabetes. The progression of cataracts is highly variable and if your vision is reduced to a point that your lifestyle is affected, cataract surgery is usually performed. Cataracts can be detected and tracked through thorough eye examinations and thousands of people undergo successful treatment each year and continue to enjoy great vision. Glaucoma is a disease of the optic nerve, often associated with elevated eye pressure, which can cause blind spots in your field of vision and eventually tunnel vision, if left untreated. As there is usually no pain and your vision deteriorates gradually, you will probably be unaware you have glaucoma until it is well developed. Glaucoma mainly affects people over the age of 40; however you could also be at risk if you have a close relative who has or had glaucoma, if you are of Afro-Caribbean origin, or suffer from diabetes. Fortunately glaucoma can be detected even in its initial stages by an eye examination. The optometrist checks the health of the nerve inside the eye, the pressure of the fluid within the eye, and also checks the visual field for any early defects. Glaucoma can usually be treated successfully by eye drops. 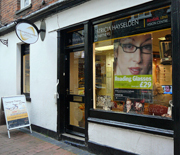 If it is diagnosed early enough it should not normally hinder you from enjoying good eyesight. The macula is the centre of the retina at the back of the eye. It is the area of the retina that you use to see straight ahead, to see colours and to perform detailed visual work, such as reading, driving or watching television. Degeneration of the macula, which is generally associated with increasing age, but can be genetic, therefore only affects your central vision, leaving peripheral vision intact. 90% of people with Age Related Macular Degeneration (AMD) have the dry form in which there are pigment changes and waste deposits accumulating between the layers of the retina and, causing central vision to become less clear. Currently there is no treatment for this, but some studies indicate that nutritional anti-oxidant supplements, such as Macushield, will be of benefit. Also individuals whose diets are rich in leafy green vegetables and don’t smoke could reduce the risk of developing Age Related Macular Degeneration. Regular use of sunspecs on bright days, to cut out ultra-violet rays, is also beneficial. The wet form of AMD is where blood vessels grow into the macula and then leak blood or fluid, which can rapidly and significantly reduce your central vision. There are some treatments available for wet AMD, either with injections or surgery: an ophthalmologist can assess your suitability.